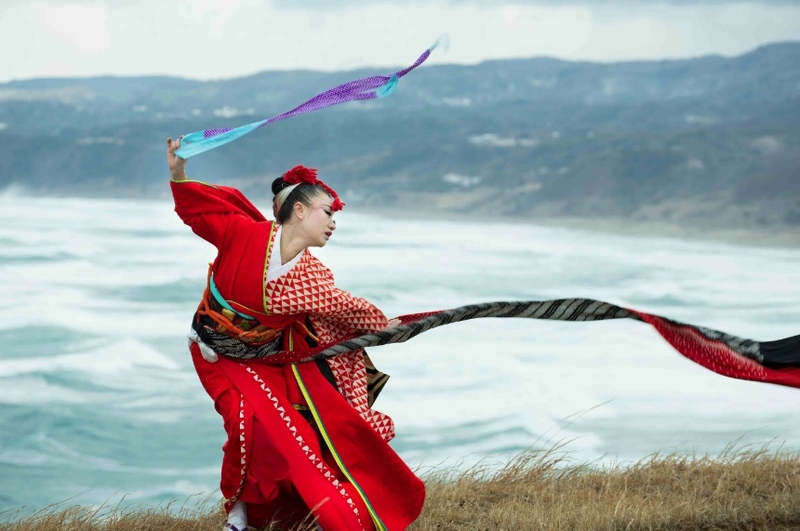 Chieko Kojima, the lead female performer for the world-renowned taiko group Kodo, joins the Taikoproject ensemble at East West Players in this unique dance theatre piece based on the classic Buddhist tale of Dojoji. “Taiko has always been a part of traditional Japanese theater traditions such as noh and kabuki, but usually only providing musical support to actors or dancers onstage,” says Bryan Yamami, Taikoproject managing director. “In ‘Road to Kumano,’ we are placing taiko front and center with the classic tale of ‘Dojoji’ as the narrative framework for the show. This show will truly be unlike anything we have done before in our 16-year history. Taikoproject was founded in 2000 in Los Angeles by a group of young, emerging taiko drummers. They were seeking to create a truly American style of taiko, blending traditional forms in which they were raised, with an innovative and fresh approach to the Japanese drum. Taikoproject first made waves when they became the first American taiko group to win the prestigious Tokyo International Taiko Contest in 2005, besting all of the Japanese taiko groups in the competition. Since then, the group has performed on the 2009 Academy Awards, the 2011 Grammy Awards, NBC’s “The Voice,” Syfy’s “Face/Off,” and “The X-Factor,” and were honored with the prestigious Visionary Award from EWP. In 2013, Taikoproject was featured in rock band 30 Seconds to Mars’ epic “Up in the Air” music video and appeared with the band on “Conan” and “Jimmy Kimmel Live” and at the iHeartRadio Music Festival. In addition to Kojima and Yamami, performers include Masato Baba, Jen Baik, Courtney Deguchi, Blaine O’Brien, Yumi Saito, and David Wells with rotating cast members Andrew Chen, Keiko Harada, Tomomi Hongo, Liz Ishida, Jenny Mimura, Doug Sakamoto, Audrey Tu, and Brian Yamagata. The creative team includes choreography by Kojima, music by Taikoproject, staging consultant David Furumoto, sound design by Glenn Suravech, lighting design by Scott LeGrand, costume design by Kojima and Sueko Oshimoto, hair styling by Jennifer Caballero, and stage managing by Brandon Cheng. This production is presented in association with Kodo Arts Sphere America and is supported in part by the National Endowment for the Arts, The Japan Foundation Los Angeles, the Sansei Legacy Fund, the Toyota Giving Circle, and AAPIP (Asian American/Pacific Islanders in Philanthropy). All performances will be staged at the David Henry Hwang Theater at the Union Center of the Arts, 120 Judge John Aiso St. in Little Tokyo. The ten-performance engagement is from Sept. 15 to 25, with Thursday through Saturday performances at 8 p.m. and Saturday and Sunday matinee performances at 2 p.m. Tickets may be purchased online at www.eastwestplayers.org or by calling (213) 625-7000. Tickets range from $35-$50. Student and senior discounts available. Dates, prices and details are subject to change.